New study finds that some bird species, the adapters, thrive in the suburbs while others, the avoiders, don’t. Avoider species require specific ecological components for survival, ones that are rarely found in developed areas. The implications for tropical birds may be large. Researchers believe there are more ‘avoider’ species in the tropics. Surviving in land that’s suddenly being transformed from forest to suburb isn’t a particularly easy change for birds, but some species find a way to thrive in suburban areas while others reproduce less and less. Photo credit: John Marzluff/University of Washington. Just as urban planners want to know how changes in a city impacts residents, biologists like Dr. John Marzluff want to know how landscapes help or hinder birds on their path to becoming stable, successful parents. Marzluff, a research professor from the University of Washington, faithfully tracked over 2,000 Seattle-area birds over a ten-year period. Dr. Marzluff tracked six monogamous bird species for a decade, learning how their breeding dispersal patterns differ according to the landscape they inhabit. Photo courtesy of Chico Covard. He and his team caught each bird, placed identification bands around their legs, and marked the locations of their nests. Most importantly, he mapped the “neighborhoods” or territories where the birds settled down and tried to follow them when they moved to a new territory. This decade of work paints a complex picture of Seattle’s bird demographics— faced with urban development, some birds continue to reproduce while some can’t seem to make themselves at home. Marzluff’s study, published in PlosOne last December, found that whether a bird can successfully raise young in urbanizing landscapes depends largely on which species it is and how that species tends to move into new territories or pair up with new partners. In general, it’s known that birds prefer to stay put in one area through the years. If they fail to produce young, though, they might move in search of a more comfortable territory or a new partner before their next breeding year. For four species in the study – the dark-eyed junco (Junco hyemalis), spotted towhee (Pipilo maculatus), Bewick’s wren (Thyromanes bewickii) and the song sparrow (Melospiza melodia) – this strategy works. These birds tended to be reproductively successful both in suburbs and forests produce young during the year, they likely would become successful parents afterwards, eventually raising chicks to adulthood. As a result, they are “abundant, productive and survive well in developed and undeveloped lands,” the study reads. The same could not be said for Swainson’s thrush (Catharus ustulatus) and Pacific wren (Troglodytes pacificus). Researchers dubbed these two birds “avoiders” since they proved hard to find in developed zones; in the suburbs, these animals simply can’t find the understory they need. Marzluff and his colleagues netted and color banded 2396 adult birds for this study between 2000 and 2010. Photo credit: John Marzluff/University of Washington. Pacific wrens also require understory, especially downed branches. “These little wren nest in moss balls that they hang or place within brush piles,” Marzluff said. In natural forests, fifty percent of avoiders were able to improve their reproductive luck after a failed breeding year, according to the study. In developing zones, this pattern didn’t hold up. For avoiders that lived in areas that were transitioning from forest to suburb, about 70% did not fledge young each year. When a bird that had not reproduced one year moved to a new territory, only 16 percent were able to move and reproduce successfully the following year. These reproductive losses occur despite the fact that avoiders move territory centers twice as far in developing areas than in forest reserves. “Swainson’s thrush is [one] of five most abundant species in northwestern forests” Marzluff explains in his latest published study. Photo credit: John Marzluff/University of Washington. Overall, the statistics from Marzluff’s study show that for avoiders, suburban development is an omen for reproductive failure. On the other hand, for the other four flexible species, development might just be an opportunity. Researcher characterized these four species as urban “exploiters and adapters.” And exploit and adapt they will. Most of them fledged young year-after-year no matter the landscape. Some of them will nest in bird boxes and even Christmas wreaths, according to the University of Washington’s press release. This group also became more abundant during urbanization, and Marzluff’s paper claims that bird diversity might even increase in the Pacific Northwest’s suburbs because so many flexible species find a home there. Meanwhile, Pacific wren and Swainson thrush in developing zones have roughly 60 percent the reproductive success that flexible species enjoy, explaining why they are hard to find in Seattle’s suburbs. Although Marzluff’s research was conducted on species of the Pacific Northwest, his findings may also apply to tropical birds facing suburban development. 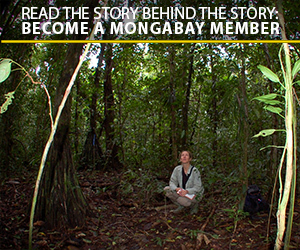 Troublingly, in tropical ecosystems a greater percentage of bird species are avoiders, Marzluff told Mongabay. The nest of a Swainson’s thrush, an understory-dweller. Photo credit: John Marzluff/University of Washington. Marzluff said there are many ways individuals can give these avoider birds a chance to feel at home. Yet, the most important consideration for conserving avoiders, temperate or tropical, remain forest reserves. These protected areas are just the place avoider birds need to move into when developing landscapes fail them. Marzluff explained that key features of reserves friendly to Pacific wren and Swainson’s thrush include size, preferably of 30 acres or more, native understory, dead trees, and even the presence of coyotes.